Nepal, the only Hindu kingdom of the world is situated between Tibet and India and has thus produced a remarkable mixture of people and culture offering us a fascinating diversity of ethnic and cultural groups with their wonderful historical background. Day to day life in Nepal is regulated by the religious calendar and strict codes on ritual observance. After Nepal's long period of isolation Kathmandu has become the gateway to Nepal. The Kathmandu Valley, which is the cultural and political centre of Nepal, is magnificent for its wealth of unique temples. 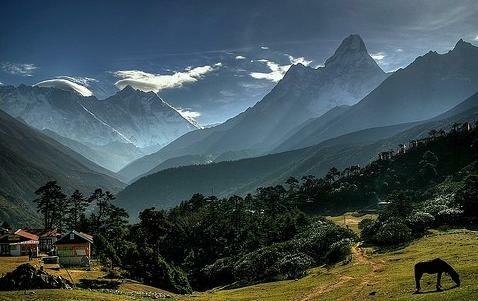 We see in Nepal the greatest mountains of the world. Differences in altitude in Nepal leads to great diversity in vegetation type, from the sub-tropical wet Terai to the semi -arid mountains wastes to the high altitude west. Around Midnight arrival in Nepal. 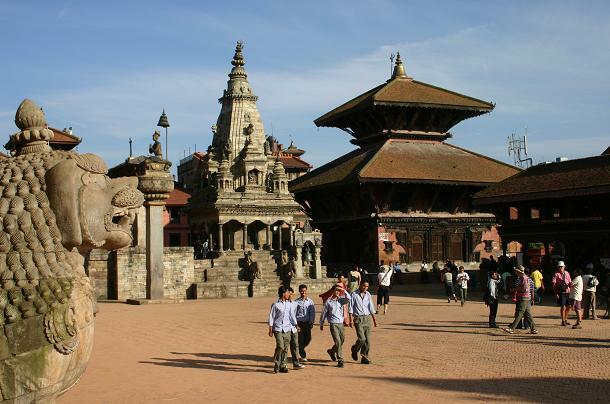 The cosmopolitan City and the capital Kathmandu is the main gateway for travellers to Nepal. You are met by an Indo Vacations representative and transferred to your Hotel. In the afternoon we enjoy the first impression of Kathmandu. Kathmandu Valley is the cultural and political heart of the country. The city enjoyed its most glorious time under the reign of Mallas in the 16th and 17th century. In the morning we start our sightseeing by visiting Durbar Square. Durbar Square is the spiritual heart of Kathmandu. The old royal palace at the centre of the city was surrounded by temples and other important buildings. 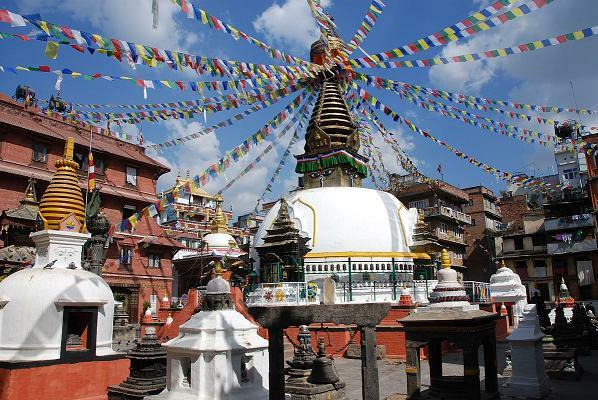 This is the most important point in Kathmandu to observe the culture and religion of Nepal. A visit of the temple of living godess Kumari is also a part of our today's Programme. After the visit of Durbar Square we proceed to visit Swayambhunath. The stupa at Swayambhunath is the most important and oldest site of Buddhist worship in Nepal. 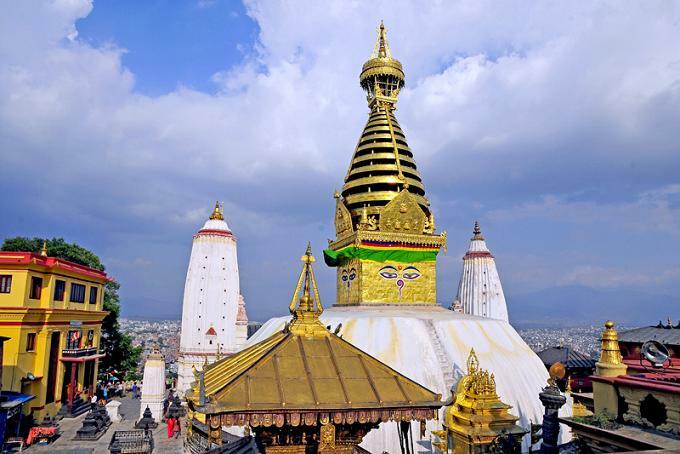 Swayambhunath Stupa is famous for the eyes of Buddha which seem to observing the world from all 4 directions. After Swayambhunath we visit Bodhanikantha. Bodhanikantha is one of the most photographed sights. We see here a Vishnu statue of 5th century reclining on his bed of serpents in the pool. Today we drive to Patan. Patan was the second largest town in the valley but it has been absorbed into Kathmandu. 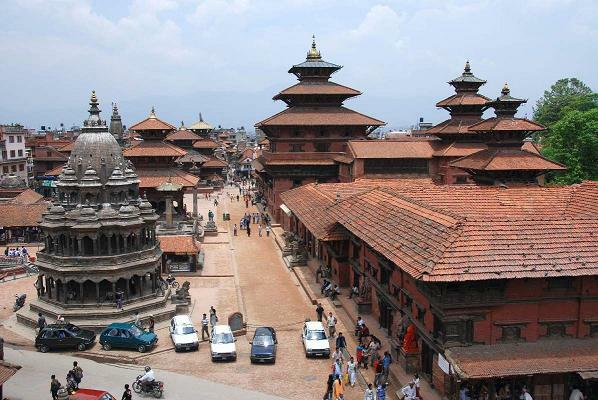 Patan was previously known as Lalitpur (the beautiful city). The temple architecture here gave this city fame to be unique and most beautiful. After Patan we proceed to Bhaktapur, the third biggest city of the valley. Bhaktapur has preserved it's medieval character better than Patan. We visit the golden Door, the Palace of 55 windows (15th century) and Pagoda Nyatapola (18th century). Today we visit the temple city of Pashupatinath which is Nepal's most important Hindu pilgrim site on the banks of the Bagmati River. 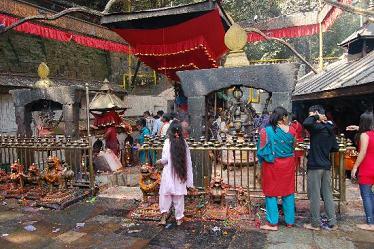 The temple of Pashupatinath is dedicated to God Shiva. 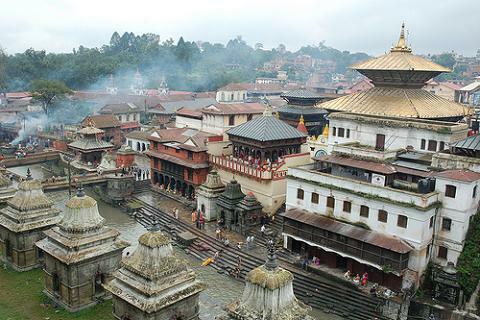 Pashupatinath is one of the seven most important holy cities to Hindus. After the visit of Pashupatinath we visit Bodnath. Bodnath is the largest Stupa of Nepal. Around the octagonal base of Stupa there are 108 images of Buddha where prayer ceremonies of Buddhist Lamas are taking place since over 2000 years. Today we drive to Dakshinkali. On the way we pass through the villages and small localities. On the way to Dakshinkali we see the rural area where most of the people make their living by cultivating their fields. The temple of Dakshinkali is a place of pilgrimage for Hindus where still animals sacrifices for the goddess Kali are performed. Afternoon is at leisure. Today we drive to the Changu Narayan Temple. This temple is 125 m above the Kathmandu valley and dates from 4th century AD. This temple is famous for its sculptures of god Vishnu showing him in different reincarnation. In the afternoon we drive to Nagarkot. Nagarkot has the best vantage point for a view of the Himalayas from the Kathmandu valley. On clear weather we can enjoy the view from Anupurna range upto Mount Everest. We have the day at leisure till afternoon. In the afternoon we drive to Dulikhel. 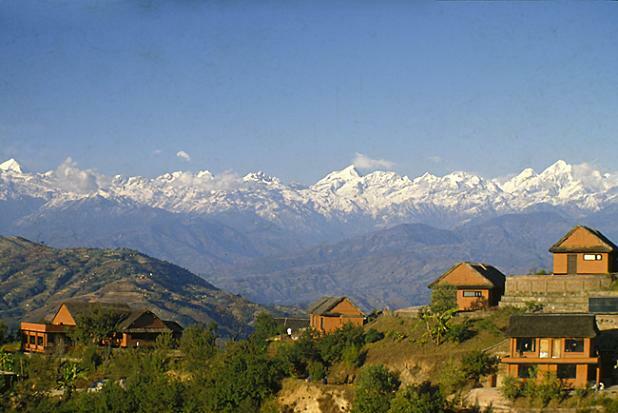 Dulikhel lies at an altitude of 1650m and offers a beautiful view of Himalayas on clear days. Today we have our dinner with music and dances in Dulikhel. After dinner we proceed back to Kathmandu. Around Midnight flight back to home.